Female marsupials have pouches to carry their babies. Other marsupials include kangaroos, wallabies, wombats, possums, and opossums. The Koala’s closest relative is the wombat. In Aboriginal language, the word Koala is thought to mean ‘does not drink’. Koalas reach a maximum length of about 24 – 34 inches (60 – 85cm). 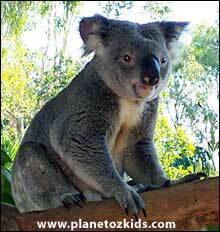 An adult male koala can weigh between 17 – 30 pounds ( 8-14 kilograms) and a female between 13 – 25 pounds (6 - 11 kilograms). They have a life span of between 12 and 15 years. The Koala's very large nose is one of its most important features. It has a very highly developed sense of smell, which helps the animal tell what eucalyptus leaves are safe to eat. A baby Koala is called a joey. Koalas breed once a year between December and March (the Southern Hemisphere’s summer) and give birth to only one baby at a time. Gestation is 35 days. At birth, the joey is very small, about the size of a jelly bean. It measures less than 30 millimeteres in length and weighs less than 1 gram. It has no ears or hair, and it can't see. As soon as the joey is born, it makes a long journey, crawling across its mother’s fur and into the pouch on her belly. 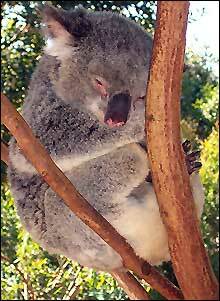 A female koala's pouch opens near the bottom instead of at the top like a kangaroo pouch. The baby Koala attaches itself to one of two teats inside the pouch and the mother's powerful muscles hold the joey so it can't fall out. It stays hidden there for about six months, feeding on milk. During this time the joey grows ears, eyes and fur.